Comparison S & P Index with US Macro Economic Activity: 2013-2014. Comparison S&P Index with US Jobless Claims: 2012-2014. 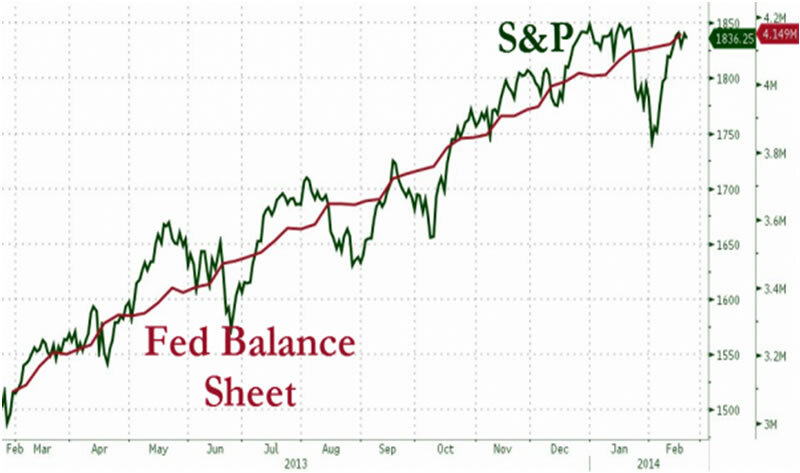 Comparison S & P Index with FED Balance Sheet 2013/2014. 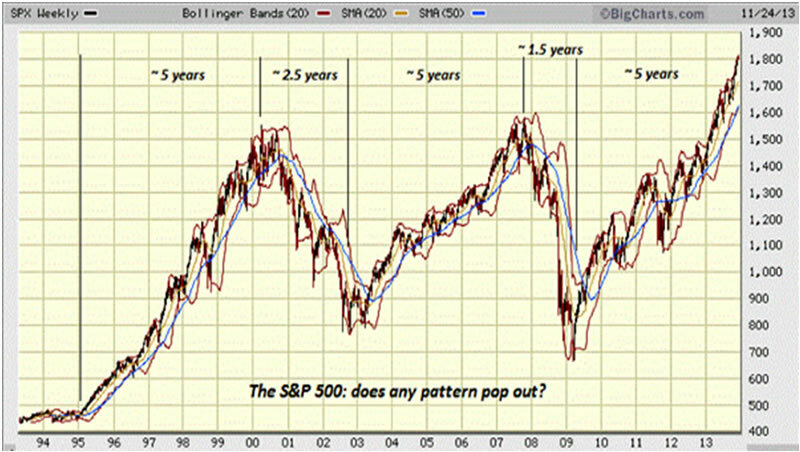 (Charts Above Courtesy of Zero Hedge Feb 22. 2014). 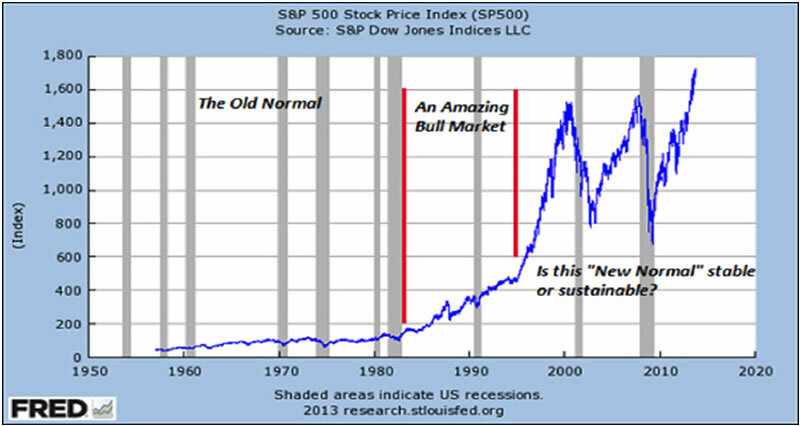 S& P Index 1950 – 2014. (Charts Above Courtesy of: “Of Two Minds” Charles Hugh Smith, December 20 2013). European Youth Unemployment Crisis Continues. Irish PRESIDENT Michael D Higgins has warned that society is "sleepwalking into disaster" by failing to tackle youth unemployment and deep-rooted issues including inequality. He believes the public has been "numbed" by "breaches of trust" arising from the role that institutions and professions played in the economic collapse. Speaking as he launched a series of seminars to take place across the country this year on ethics, President Higgins told the Irish Independent there was a need to discuss how trust could be restored and what type of institutions were needed for the future. "I believe this discourse is not only urgent in Ireland, but essential in Europe if we are not going to abandon the European dream, and allow extremes to be built on top of an exploitation of youth unemployment," he said.
" I think 100 years on from 1914, you could say that Europe sleepwalked into a terrible disaster that was the carnage of World War I. In exactly the same way, if you have a crisis of an economic and social kind, you can't sleepwalk through that, you must act." !It's also very consistent with our literary tradition, our peacekeeping tradition, with the best of our Irishness and I think it's well worth it," he added. President Higgins said he believed it was important to challenge the notion that a "group of experts" should decide the "major decisions" to be taken in people's lives. Such outspoken honesty has not made President Higgins popular among certain sections of the Irish political elite. One prominent journalist in a national newspaper newspaper actually called for his impeachment. President Higgins is a hero, his truth must break through into the consciousness of the ruling European Commission. It is obvious to me, and a growing active minority, that unless the current bankrupt European economic policies are modified and modified quickly great social and political instability will explode throughout the entire Euro area. Such a development will make the Ukraine experience the norm rather than the exception. Thus in my view President Higgins is right, we will sleep-walk into a new Pan-European nightmare unless we Europeans wake up to the true reality around us. We must “de-trance” and take action to restore the dream of a new, fair and equitable social covenant that was born out of the devastation of World War II.